Did you know that St. Andre Gift Shop had a recent face lift? 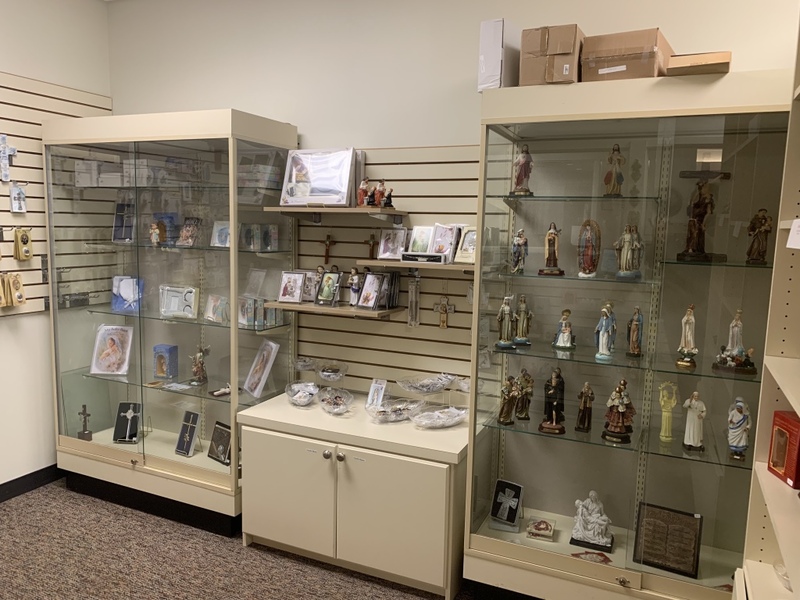 Stop in before or after any of the week end Masses to browse in the newly redesigned shop and the larger variety of religious items. If you are looking for a religious gift for a special event, St. Andre is where you may find it. There are gifts to mark a Baptism, First Communion and Confirmation, weddings or anniversaries. You can choose from an assortment of gift sets, rosaries, necklaces, statues, crucifixes, cards and other items that might fill that need. The shop carries both weekday and Sunday missals as well as Bibles; and a line of religious books especially geared for children. A new line of statues was recently added; you are sure to find one of your favorites among them. The shop also carries a line of inspirational gifts as well as inspirational music CD’s by Manfred Dreilich, Music Director for St. John and Leah Crisafulli. The St. Andre Gift Shop is staffed by members of the St. John’s Council of Catholic Women and is open before and after Mass each weekend. For a week day appointment, call Linda at 305-5095. Please stop by. The ladies of Council will be happy to assist you.